Are you an "I'd rather do it myself" type of person? If so, this article is for you! • Running Shoes: Walking is recommended for everyone who can do it. Even if you don't run, a properly-fit pair of running shoes is really important. To get the right type of shoe for your foot anatomy, consider the Shoe Dog Service at Road Runner Sports. Expect to pay about $200 for a good pair of running shoes. You can learn more details about running shoes here: Running Shoes. 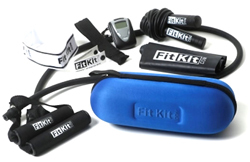 • "First Step To Active Health®" Kit: Thera-Band® products have been on the market for years. The "First Step To Active Health" kit contains a stretch band, some educational cards, and a log-book. 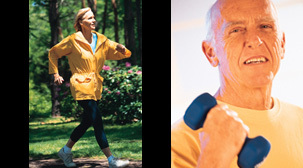 It's useful for older adults who are beginning a new exercise program. Ask your physician: you might be able to obtain it for free! • A Plastic Jug: Save several gallon-size sturdy plastic jugs that have good handles. You can use these as dumbbells. One gallon of water weighs 8.3 lbs. If you fill one with sand, it will weigh about 13 lbs. You can thread a rope or leather belt through the handles when you want to use them as ankle-weights when you do seated leg (knee) extensions, or, if you want to double the weight. For example, you can hang 2 of them over your shoulder (one in front and one in back) when doing squats or lunges. • A Back Pack: To add a little extra weight to exercises such as squats, lunges, and standing up from a seated position, there are weighted vests available for this purpose. But, instead, you can wear a back-pack stuffed with text-books or soup cans. • Stretch Bands: Stretch bands are now widely available (see our Resistance Training Gear page). They come in multiple resistance levels, each one identified by a different color. But, you could also use a bicycle inner tube. Either way, a variety of exercises can be performed. Stretch bands are safer than heavy dumbbells for older folks. • A Chair: A sturdy chair with no arms or wheels can be used for inclined push-ups, low-back exercises (bend forward at the waist while seated, then back up) and others. Use 2 chairs (place one hand on the seat of each chair) for exercises such as dips. For some exercises, a chair with arms is helpful. Examples include: leg press (simply stand up!) and leg extension (lift one foot off the ground and straighten your leg). Chairs are also helpful during balance exercises. • A Flight of Stairs: There are several exercises you can perform on a flight of stairs. Just walking up and down will simulate lunges. As your legs get stronger, walk up 2 steps per stride. This will give you an aerobic workout in addition to improving your leg strength. You can also do inclined push-ups on a flight of stairs. And, if you are very careful and are able to, hopping down to the floor from the bottom step is good for stimulating bone density. Don't do this if you have back or hip problems though! Once you collect some of the materials listed above, then you can develop an exercise program. You don't have to be a healthcare professional or an exercise physiologist to design a therapeutically-effective exercise program. However, if you are 50 years or older, especially if you're out of shape, make sure you obtain clearance from your personal physician before beginning a new exercise program! Even if you can't meet all of these guidelines, try to perform all 4 of the activities each week. And, keep in mind that, to improve your health, you don't have to exercise "hard" (see Exercise Intensity below). Most of the health benefits from exercise occur with surprisingly little effort....ie., plain 'ol walking may do it for many people (Pate RR, et al. 1995). a) Calculate your maximum HR: The most common formula for this is: 220 - age. Note that this formula has been questioned. The formula was based on data collected only in males, so, it is not the perfect choice for women. If you would like to be more precise, then, see my other review "Heart Rate, Exercise Intensity, and Training." Since you're not going to be exercising hard, it's OK to use 220 - age. b) Calculate your target HR: Now that you know your maximum HR, you can calculate your target exercise HR. For health benefits, most people only need to exercise at about 50-60% of their maximum. So, the target exercise HR for a person who is 65 yrs old should be 78-93 bpm (during actual exercise). Monitoring your heart rate while you're exercising isn't difficult, but it's super-easy if you wear a heart rate monitor, or an activity tracker that has that functionality. For heart rate monitors, we like the ones from Mio. For activity trackers, FitBit has been shown to have excellent accuracy. In 1960, a researcher named Gunnar Borg, PhD, developed a numerical scale to help determine how hard someone was exercising, without the need to measure their heart rate. It simply asks the person who is exercising to pick a number between 6 and 20 (6 = little to no effort; 20 = maximum effort possible) to represent how they feel while they are exercising. (Adding a zero to these numbers is a rough approximation of exercise heart rate.) This is called the Borg Scale. Though it may not seem very scientific, it's been used in exercise research for many decades. Recently, it has been shown that being able to speak in full sentences while exercising is also a fairly useful monitoring clue. This is termed the "Talk Test." (Foster C, et al. 2008) (Norman JF, et al. 2008) (Persinger R, et al. 2004). If you're breathing so fast that you cannot talk comfortably, then you are exercising too hard. There's one key point to emphasize regarding the measures of exercise intensity discussed above: these do NOT indicate your degree of aerobic fitness. Rather, they simply tell you how hard you are exercising right at that moment. To clarify this, let's say you and your friend are jogging together. Your heart might be beating at 130 bpm, whereas your out-of-shape friend may have an exercise heart rate of 165. 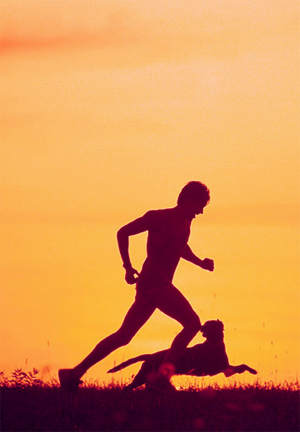 So, even though both of you are jogging at the same pace, the intensity is much higher for your friend. The best time to obtain your resting HR is within seconds of waking up, even before you sit up in bed. You should not have consumed alcohol the night before, and, you don't want to wake up by having the dog jump on you! Learn how to take your pulse and do this once or twice per month. To assess your performance on these tests, you'll need a copy of the ACSM book "Complete Guide to Fitness & Health." (see below). 1) Discuss it with your personal physician (this is very important!). 2) Make note of some measurements such as body weight, waist circumference, BMI, and resting heart rate. This will be your baseline and will be helpful to monitor your progress and keep you motivated to continue. Then, plan out your program. Use the "Talk Test" to monitor how hard you are exercising. Try to do some form of aerobic exercise or physical activity 5 days per week. Put a weekly schedule on your refrigerator as a visible reminder. Once or twice per month, perform the "Walk Test" to assess improvements in your aerobic capacity. Strive to get your resting heart rate down to 70 beats per minute, as long as you don't experience lightheadedness. At times, it seems there is as much misleading information on the Internet as there is quality information. How can you separate the good from the bad? As far as I know, no organization rates or evaluates the quality of information on "exercise" web sites. In my opinion, this is needed, because exercise really is a highly effective treatment of a wide range of health conditions. Further, it is possible to exercise too much, and/or, do the wrong kinds of exercise. When searching for quality health information on the Internet, look for web sites that display either the "HON" logo and/or the "URAC" logo at the bottom of the home page. This means the content on that web site has been reviewed. If it displays the "HON" logo, it has met the standards of "Health On The Net", a European group that assesses the quality of health information web sites (www.HON.ch). If it displays the "URAC" logo, it has been certified by the US group URAC (www.URAC.org). An example of a health information web site that has obtained certifications from both organizations is www.WebMD.com. 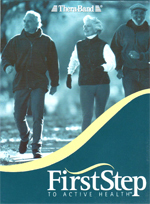 • First Step to Active Health® (www.FirstStepToActiveHealth.com): This web site has a variety of outstanding resources for older adults who are just starting on a new exercise program. Resources for healthcare providers are also available. The information and guidance is "evidence-based" which means that there is solid scientific research backing up their approach. Note the "HON" logo at the bottom. • Exercise & Physical Activity Guide from the National Institute on Aging (www.NIA.NIH.gov): In my opinion, this is a superb web resource for older adults. The web sites listed above are excellent, but you really are "on your own" with these. The information they provide is good, but who do you turn to when you have questions? The web sites for the American Council on Exercise, and, the American College of Sports Medicine offer access to certified health/fitness professionals. In 2017, ACSM published the 2nd edition of their "Complete Guide to Fitness & Health" ($24.95). This book is intended for consumers, however, it is pretty detailed. 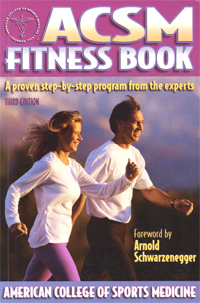 "ACSM Fitness Book" ($16.95) is an older book, but I think it's a good one. It's also from the American College of Sports Medicine. It was first published in 1992. The 3rd edition, pictured here, was published in 2003. 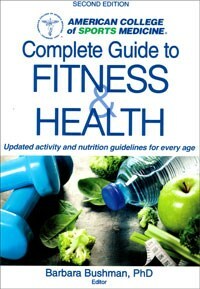 It was subsequently replaced by the "Complete Guide to Fitness & Health" (see above). The ACSM Fitness Book is much shorter (175 pages) and is loaded with full-color pictures of real people demonstrating proper technic on a variety of exercises. 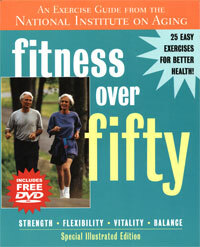 Fitness Over Fifty ($19.95) is published by the National Institute on Aging. This is an ideal resource for older adults. 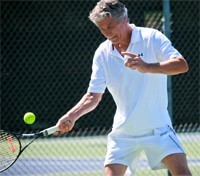 It is loaded with large photos of older adults doing various exercises.